A new evolution of space net rigging finds its way into the mainstream media as a worlds first music gig high in the sky above Queenstown, New Zealand. Sponsored by Jägermeister and featuring the UK sensation band Modestep, this was truly a project of epic proportions. The space net has now found another use outside of its extreme platform for sports such as BASE jumping, rope swings and highlining around the world, having been converted into a globe trotting suspended musical stage. Who would have thought, right? What a pleasure it was working with the wonderful staff at Jägermeister this past September in the beautifully scenic countryside of New Zealand, especially while getting to know the witty and talented musical duo of Modestep. Pat Lundy and Josh Friend, you two are legends! There’s so much that takes place behind the scenes to make a project like this become a reality so I wanted to officially recognize the hard work and efforts of Secret Compass, who helped coordinate this event with me for 15 months leading up to the live gig itself. Tom McShane, Tom Bodkin and Dave Lucas you guys are amazing individuals who really worked your butts off to get this ball rolling and on time. To all the invaluable local New Zealand mountain guides: Hugh Barnard, Davie Robinson, Bruce Dowrick, Tarn Pilkington and Tony McCutheon, without you all we would have been lost in the cold wilderness for a long time. To AJ Sutherland, Donna Allen, Tim Reid and Tim Pierce your audio and visual expertise allowed us to have real sound in real nature. Tony Young, thanks for creating all the stunning aerial drone shots that made for a beautiful cinematic touch. Geoff Ellis, you persevered in working around the clock to create the necessary perspex platforms for all the instruments and band. Heli Glenorchy, your piloting skills in the backcountry are top notch and nothing short of perfection. Sherwood Queenstown thanks for looking after us and providing ample flat whites for our caffeine needs every morning. Last but not least, my main rigging hand and long time adventure partner, Scott Rogers, you’re such an incredibly talented professional to have at my side when undertaking these big commercial stunts. Your thoroughness and diligence in all these impressive endeavors with the Moab Monkeys never goes unnoticed. The same can be said of Cody Tuttle, of Wingate Motion, who was one of the principal shooters for the main feature and ‘behind the scenes’ video seen below. Your artistic eye and fierce courage to get the shot in the toughest of circumstances is truly inspiring. A lot more could be elaborated about the trials and tribulations of this crazy project but I’ll simply let the videos speak for themselves. Thanks everyone for all the hard work and enthusiasm on this breathtaking worlds first live music gig high in the sky. Cheers! I've committed my life to the pursuit of world exploration and pushing the boundaries of human limits. 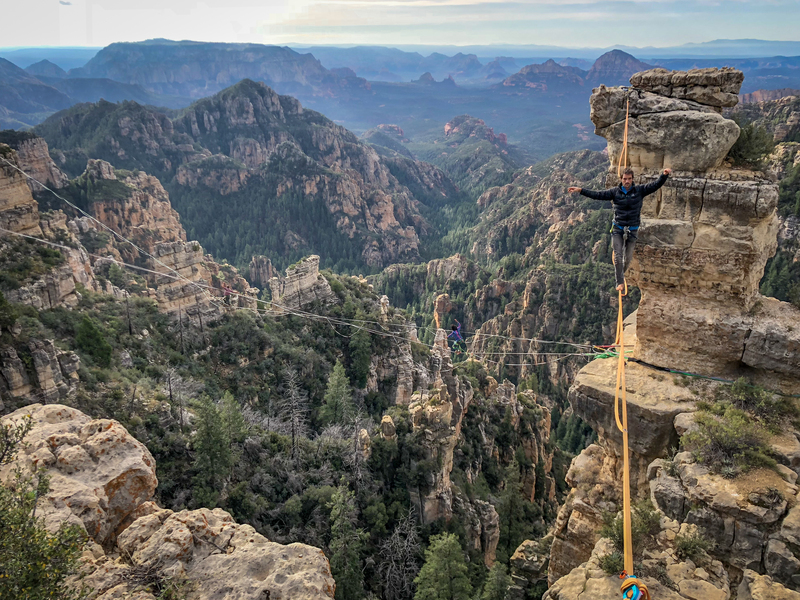 I have a strong passion for climbing technical rock routes, BASE jumping in the mountains and walking lines of 1-inch webbing at varying heights. In this shared space I hope to convey the stories of inspiring outdoor communities and individuals who interact with nature adventurously. Slackline Media is a shared platform where all forms of slackline and other adventure sport related news, blogs, projects, photos and films can be openly viewed and appreciated. It showcase the evolving lifestyle of actively balanced individuals who are continually pushing the boundaries of human achievement. Copyright © 2018 slacklinemedia.com All Rights Reserved.